Is there a program that does exactly this? Feel free to file bugs etc. here, or comment here. Thanks to orschiro for the nice question, and Rinzwind for the encouragement! This applet will most likely be available by default in Ubuntu Budgie 19.04, but can now be achieved here as an experimental one. You may also want to consider Workrave, although it is no longer under development. I found it easy to use and highly customizable. It also has some preatty nice stats about how you use the computer and how many breaks you take. Lastly, I believe it can also sync itself between many computers, which is useful if, for example, you work both on the laptop and on a school computer. 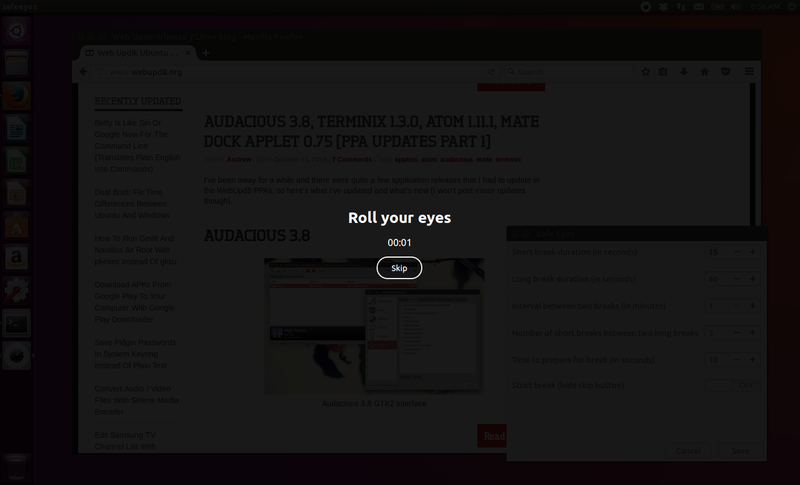 Make sure you check out the "Reading" mode! 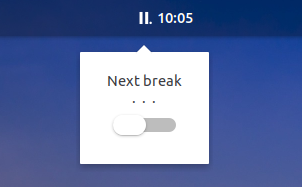 The above feature of only counting the time you've been actively using the computer can be seen as a bug if you're not doing much (no mouse, no keyboard events) because it will only prompt your break when you cumulate 1h of usage (or how much time you've set up). In these situations, enabling the "Reading" mode will make it prompt at the exact time, regardless of usage. Why 1500 and 300? because that's seconds, 1500 seconds /60 seconds per minute = 25 minutes. Below is a script for a timer that allows setting variable session and break time, as well as methods of signalling the break. Remember that any script on linux must be saved as a file and have executable permissions set with chmod +x /path/to/script.sh. Once that is done, you can bind the script to a shortcut as show in How do I bind .sh files to keyboard combination? or create a desktop shortcut as shown in How can I create launchers on my desktop? 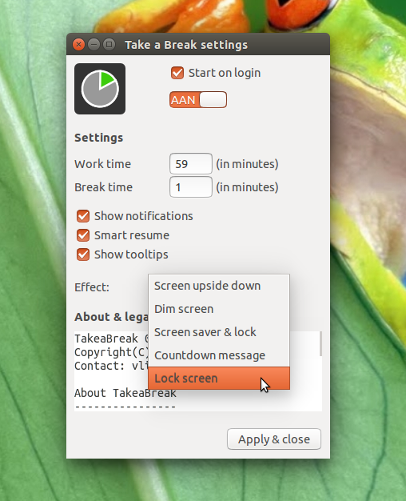 gnome-terminal --full-screen  -e  "bash -c 'sleep $1 | dialog --progressbox \"TAKE A BREAK\" 100 100 ' "
Here is another tool called Safe Eyes for the same purpose. I have used xwrits for many years for this purpose. Not the answer you're looking for? 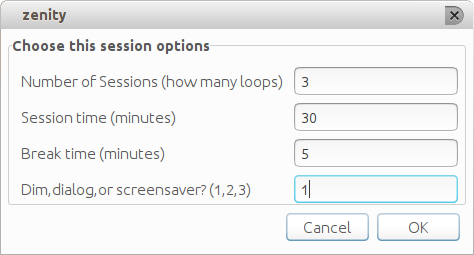 Browse other questions tagged software-recommendation lock-screen or ask your own question. How do I bind .sh files to keyboard combination? 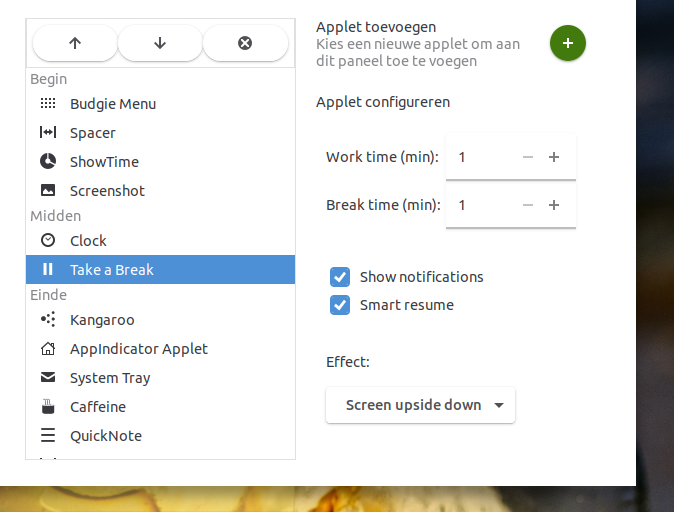 How to enable popups after every one hour for exercise/break? 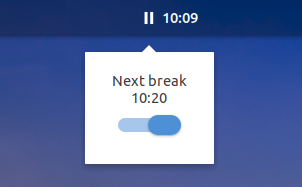 Is there a program that can put some kind of visual notification on my screen for use with the alarm clock app?